Brett Kavanaugh continues to get ripped to shreds. Meanwhile, Christine Blasey Ford’s story falls apart more and more. Now the ex-boyfriend of Christine Ford tells all. He even says she helped a friend prepare for a polygraph test. How did anyone even believe her for a minute? Better yet, how did liberals believe her at all? Do they really believe her or are they just that determined to try to take down Trump or anyone affiliated with him? It’s time to question everything. Is she really a doctor? She does have a doctorate in education, but she is not a board-certified psychologist in California. To take things a step further, Stanford recently changed her title from “psychologist” to “affiliate.” This was after she came public with her allegations. In California it is a felony to misrepresent yourself in this manner. The former boyfriend, whose name was redacted, also said Ford neither mentioned Kavanaugh nor said she was a victim of sexual misconduct during the time they were dating from about 1992 to 1998. 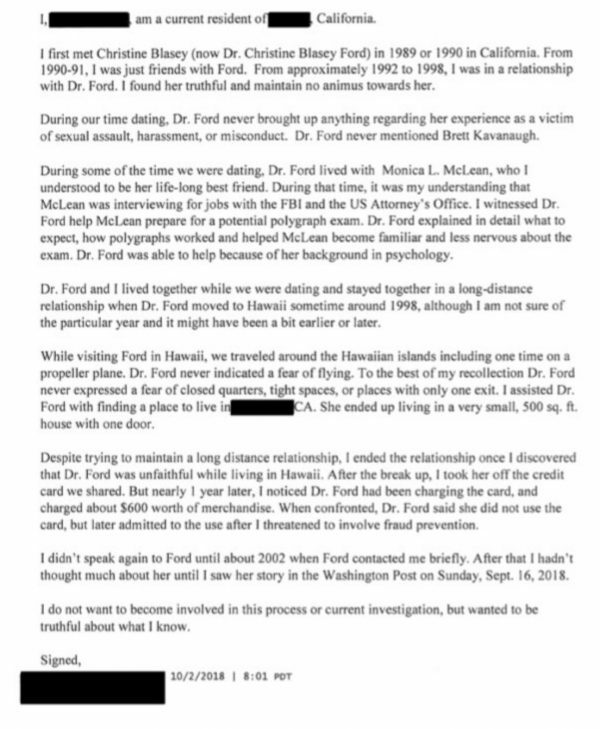 He said he saw Ford helping a woman he believed was her “life-long best friend” prepare for a potential polygraph test. He added that the woman had been interviewing for jobs with the FBI and U.S. Attorney’s office. He also claimed Ford never voiced any fear of flying (even while aboard a propeller plane) and seemingly had no problem living in a small, 500 sq. ft. apartment with one door — apparently contradicting her claims that she could not testify promptly in D.C. due to a fear of flying, as well as her suggestion that her memories of Kavanuagh’s alleged assault prompted her to feel unsafe living in a closed space or one without a second front door. After Kanavaugh is confirmed Friday, there needs to be a full investigation into Ford, Dianne Feinstein and any other Democrat who is going after Kavanaugh. She needs to be held accountable for what she has has done to this man.